1" x 4" etching and aquatint on Magnani etching paper. I'm attending the Wednesday night sessions/open studio at Il Bisonte, one of many historic graphic arts/print studios in Florence. There's a small group of us and once a week, after dinner we have access to the nuts-and-bolts materials and tools of a well-equipped printmaking studio. There are acid baths for zinc and copper, an aquatint box and hot plate, a guillotine cutter for metal plates, many presses and a professional printer helping and supervising those who need assistance in making plates and prints. I have several small works in process and I'm trying to meet the deadline for a miniature print competition so I'll decide soon what's good enough to push to finish and send. These were done in my first few days--as I was trying to refamiliarize myself with drypoint and etched lines. At the top is a two-plate etching and aquatint. While below, is a print made from a drypoint zinc plate, printed on a student-grade, Japanese paper. Drypoint means I used a sharp scribe to scratch directly into the metal. It raises a burr and prints with an easily recognizable hazy line. As with lots of my work, it's based on small, scribbled doodles--these of scientific and measuring devices--rulers, protractors, beakers, etc. These are all hand drawn and I like the play of the obvious "wrong-ness" of the drawing. The inexact spacing and wandering line that negates the purpose of these objects in the real world. I've only printed these copies but I hope to make some time and print some clean ones on good paper. Love this print! I need a Not to Scale for my office as it is my motto! As a non-architect working on architectural graphics and renderings at an architectural firm where everyone else is an architect, my use of scale is the running office joke. Great print, Andrew! Thank you Andrea. I'm glad you like this. It was the first print I made in my Wednesday night class and the proctor was rather disappointed encouraging me to do something a little more, "more". 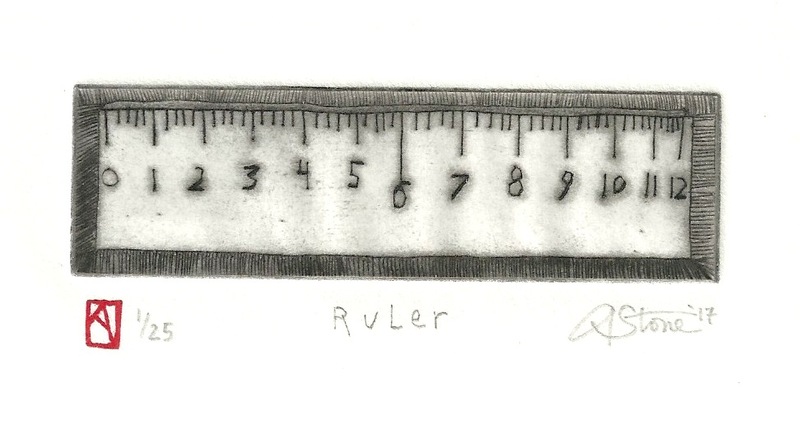 This was the second try as my first one--the drypoint, divided my "inches" into fifths rather than quarters....(I have one of those rulers too that have the foot divided into 8ths/16ths/10ths/etc...but this was supposed to instantly recognizable as a "ruler". I'll have hopefully a small edition of these printed next week if you think you'd like one. A.